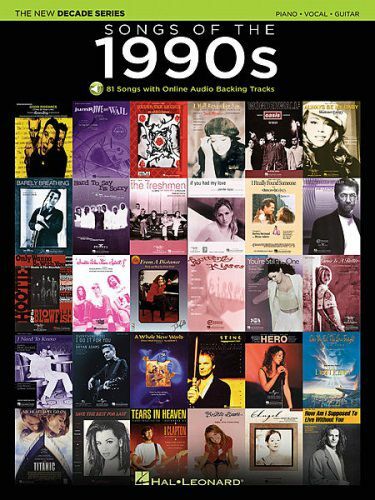 81 of the decade's best arranged for piano and voice with guitar chord frames and including great orchestrated backing tracks so you can play and sound like a pro. You access the tracks online for streaming or download. Songs include: Angel · Barely Breathing · Black Velvet · Butterfly Kisses · Can You Feel the Love Tonight · Candle in the Wind 1997 · Change the World · (Everything I Do) I Do It for You · Fields of Gold · Friends in Low Places · From a Distance · Good Riddance (Time of Your Life) · Here and Now · Hero · How Am I Supposed to Live Without You · I Need to Know · I Will Always Love You · I Will Remember You · Ironic · Livin' La Vida Loca · Losing My Religion · Macarena · More Than Words · My Heart Will Go On (Love Theme from Titanic) · Right Here, Right Now · Smells like Teen Spirit · Smooth · Tears in Heaven · Under the Bridge · Vision of Love · When You Say Nothing at All · A Whole New World · Wonderwall · You Must Love Me · You Were Meant for Me · You're Still the One · and more.